CINCINNATI – Cincinnati Bengals head coach Marvin Lewis knew Sam Hubbard was a high-motor player who could grasp NFL schemes quickly. 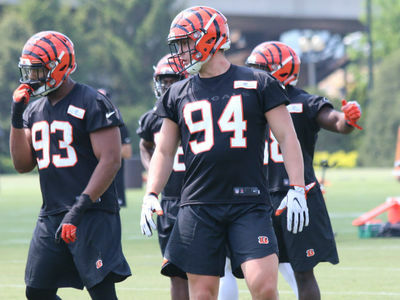 So it's no surprise how well the Bengals rookie defensive end has learned team fundamentals this spring, from rookie minicamp and Organized Team Activities (OTAs) in May to mandatory minicamp this month. Lewis wants to see how Hubbard – like all rookies – makes the transition to pads when training camp opens in late July. From there, Hubbard will have an opportunity in preseason games to show his ability. RELATED: Who is Sam Hubbard, the Bengals' No. 77 pick? Hubbard, the former Ohio State and Moeller High School standout, is a lifelong Bengals fan . The third-round draft pick has a great deal of pride walking into the Paul Brown Stadium locker room. In some ways, being drafted by the Bengals has allowed Hubbard's football journey to come full circle. Lewis and Ohio State coach Urban Meyer have remained friends through the years and Lewis has known about Hubbard for a while . “It is a unique thing," Lewis said. "We’re blessed to be able to add him. He comes from a quality family. He has that support and that going for him." Marcus Lewis , Marvin's son, played lacrosse for Indian Hill, and Hubbard’s brother, Jake, played for Moeller. Marcus and Jake, both of whom graduated high school in 2008, were also on the same summer lacrosse team with Carolina Panthers linebacker and former St. Xavier standout Luke Kuechly . That connection is certainly ironic, yet Sam Hubbard was no stranger to being around NFL players and coaches. During a pro day in Columbus in late March , Hubbard went through some drills in front of NFL personnel, including Lewis. At the time, Hubbard said the experience took his breath away. Later, he spent a day at PBS prior to the draft. The Bengals knew the type of player and person they would be getting if they were fortunate enough to draft Hubbard. Hubbard has quickly learned being an NFL player is a business. He wants to prove the Bengals made the right choice with the No. 77 pick. Lewis said Hubbard’s experience with the Buckeyes has helped with the transition. Ohio State defensive line coach Larry Johnson has a reputation for helping prepare players for the NFL and did just that for Hubbard. Bengals defensive line coach Jacob Burney says Hubbard has a personality that lays everything on the line on the field. He likes what he has seen from Hubbard this spring. "He loves the game," Burney said. "He is a student of the game. He has good conditioning. He can handle this. He takes it in stride. He's very coachable and very approachable. He's got a bright future in the NFL." Austin is confident Hubbard will be the same player or better with pads, and he wants to see how Hubbard will continue to focus on details like improvement in getting off the ball, rushing tackles, creating his signature move, containing the run and his hand placement. Hubbard’s work ethic and approach also have impressed Bengals defensive end Michael Johnson.